You mustn't call them by name... they are the "good neighbours," the "fair folk," or the "gentry." Don't draw their attention, for those they notice are drawn into their stories, which no mortal can survive unchanged. Stay away from the edges of the dark woods, respect your superiors, and do what society expects. Or the faeries will come for you! 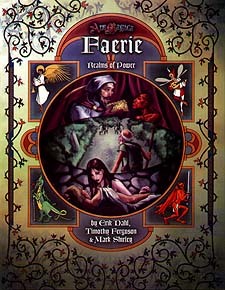 The faeries of Mythic Europe live according to roles and stories, drawing vitality from mortals who play by their rules. Some vampiric faeries steal vitality from blood, while others draw it from the garlic placed over doors to keep them out. Some fey dragons live by devouring knights and feasting on the fear they create, while others exist to be defeated, drawing vitality from the knight's victory. But afterwards, the dead dragon and the defeated vampire always take on a new role, to continue the faerie story. What story will they make you tell?